Been awhile since I tried that brush. You made it work well. This Portal receives your information through our application "Let's Create! Pottery" and Facebook Login. When using the portal you consent to the collection, storage, processing and disclosure of your information. Irrespective of which country that you reside in or create information from, your information may be used by this Portal in any country where this Portal operates. Please note that any pottery design, comment or vote that you provide to us is information you are asking us to make public. You should always be careful about what you make public. ClientID: a unique, randomly generated string that gets stored in the browsers cookies, so subsequent visits to the same site can be associated with the same user. Anonymized IP address: the IP address that has a part of it removed. Facebook identifier and facebook name, to identify you in our Portal. IP address, to prevent illegal voting and protect from unfair behaviour. 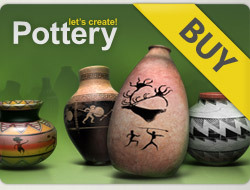 Pottery images, comments, votes and other information for the purpose of voting system. We do use this data only to provide the service. We do not pass it to any 3rd party companies. Your personal information may be transferred to, and processed in, countries other than the country of which you are a resident. These countries may have data protection laws that are different from the laws of your country. Specifically, our portal and databases are currently located in Canada, and our third-party service providers and partners operate around the world. This means that when we collect your personal information we may process it in any of these countries. We do not knowingly collect or solicit personal data about or direct or target interest based advertising to anyone under the age of 13 or knowingly allow such persons to use our Services. No one under the age of 13 may provide any personal data. If we learn that we have collected personal data about a child under age 13, we will delete that data as quickly as possible. If you believe that we might have any data from or about a child under the age of 13, please contact us. For everyday stress iQuarium is more than enough to relax. Chill out while watching your Parrot Chichlid fish swimming in its tank, feed it, play with it, interact with it or... do nothing - just listen to your own relaxing music and the air bubbles climbing up slowly to the water surface and let iQuarium soothe you and calm you down. As time passes by you will find new decorative items in your inventory so you can arrange your relaxing space whatever way you like. Just don\'t forget that your fish is a living creature and it depends entirely on you what kind of personality it will develop! iQuarium provides a sensation of relaxation and calm but still delivers tons of entertainment and fun! Join the Jelly forces now and lead them to glory in this uneven and fierce fight against the invaders! Use your tactical skills and wisdom to tip the scales of victory in your favor in order to save the Diploglobe and the Jelly nation from the agressors! Yes we can! Or should we say: yes we can... knock the can! Check out the most addictive and FREE game on App Store and become a cold blood sniper while aiming at and knocking down piles and pyramids of cans! Start playing and you just won't put down this marvelous title till you drain your battery empty! You have been warned!